A pair of wild Whooping Cranes has produced eggs in Louisiana for the first time in seven decades. A mated pair of Whooping Cranes has produced eggs in the Louisiana wild for the first time in 70 years, the state Department of Wildlife and Fisheries announced Tuesday. The announcement, made by LDWF Secretary Robert Barham at the 13th North American Crane Workshop in Lafayette, is a watershed moment in the reintroduction of the endangered birds to the wild. Once widespread, the Whooping Crane population had plummeted to just 21 total birds by the 1940s, mostly due to hunting and the conversion of wetland habitat into agricultural fields. “I am proud today to announce to you that our small population of Whooping Cranes is adjusting well to life in the wild, and a mating pair has produced eggs in the wild for the first time in over 70 years on the Louisiana landscape,” Barham said. 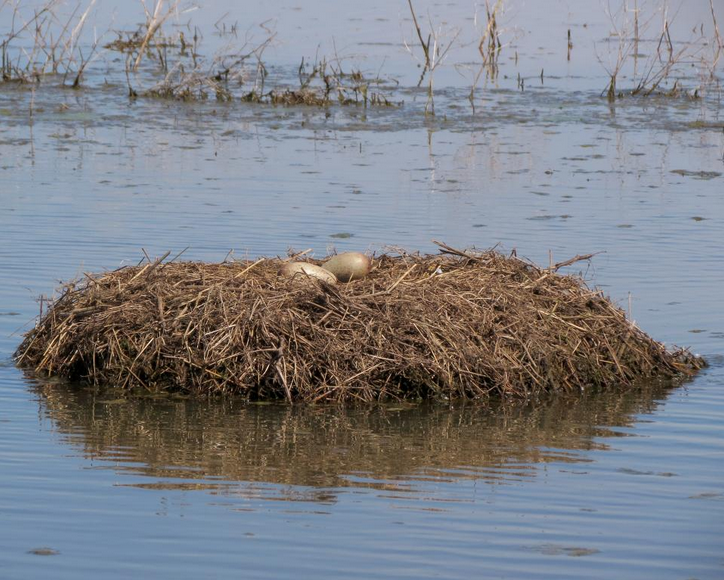 The two eggs are located in a single nest in Vermillion Parish, and are being actively tended to and incubated by the parents. The LDWF has been breeding and releasing Whooping Cranes into the wild since 2011 — to date, 50 of the birds have been released, and 30 still remain. The rest have succumbed to predators or natural health problems, and five have been killed or wounded in shooting incidents. The Audubon Aquarium of the Americas has announced the hatching of three more African Blackfooted penguin chicks — bringing to eleven the number of the endangered birds hatched at the Aquarium in one year. The end of summer means back to school, back to the grindstone, back from vacation. And for millions of birds, it means time to fly south for the winter. One particular type of bird — the purple martin — has spent the summer preparing for that journey under the Causeway bridge. Right where the south shore connects to the Causeway, tens of thousands of the birds have maintained a roost, with a second roost further along the bridge. They sleep under it, flying in right at sunset. The last summer stragglers are now getting ready for their flight south.